As your child grows, it’s important to introduce them to new challenges so they can develop intellectually and emotionally. 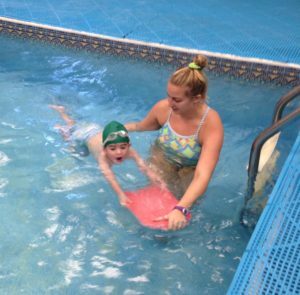 Swim lessons for toddlers are a great way to challenge your child. Lily Pond Country Day School offers year-round swimming lessons in our indoor heated pool for children enrolled in our preschool or summer camp who are over the age of three and potty-trained. Our faculty is staffed with upbeat and experienced teachers who are trained to present information in a variety of ways so that each child’s intellectual, physical, and creative development is individually maximized. Our indoor heated pool provides a convenient, year-round place for swim lessons for preschoolers and toddlers attending our facility. With our interdisciplinary approach to learning and multiple innovative programs taught by a passionate and supportive staff, you can rest assured that your child will be as successful in the water as they are in the classroom. By introducing your toddler to swimming early, you can help your child develop self-confidence in their abilities and make them excited to take on future activities they may find difficult, setting the foundation for a happy, healthy lifestyle for years to come. But swimming isn’t just about facing challenges. Childhood fitness is essential to early development, and preschool swim lessons are an awesome way to get your child’s body moving while giving them opportunities to learn, grow, and make new friends. Beyond just being a fun summer activity that helps children keep cool, swimming develops strength and flexibility through physical fitness. Swimming helps increase stamina and can actually improve your child’s posture! Interested in Bergen County swimming lessons for your child?